The Prestwich Memorial opened in 2008 as an attempt at resolving a protracted and sometimes unsavoury dispute sparked in 2003 when a property developer discovered human remains in central Cape Town whilst digging the foundations for an apartment complex. These remains were likely those of the colonial working classes, buried in the many unmarked eighteenth and nineteenth century graves. For certain activists, the remains were identified as those of their enslaved ancestors. A dispute began between people opposing exhumation on the grounds of respect for ancestors, versus those who advocated exhumation owing to the unprecedented opportunities offered to furthering historical and scientific knowledge. Following a public consultation process, the bones were exhumed, but were not subjected to analysis. 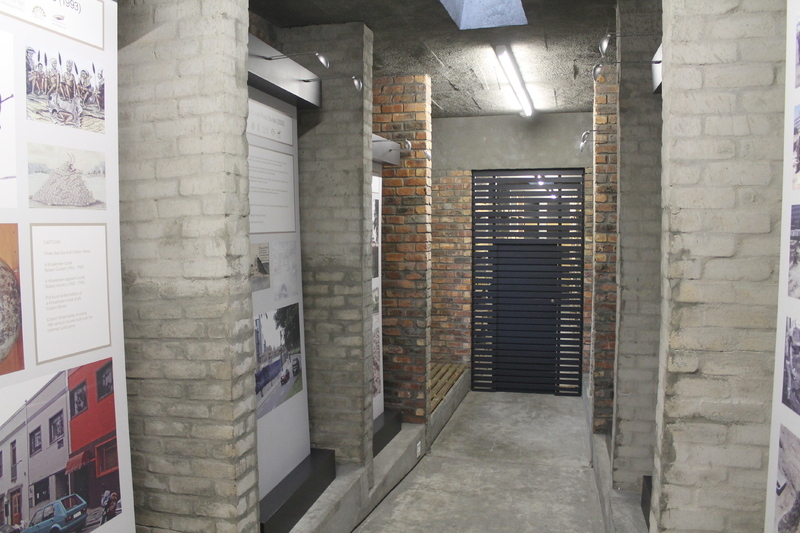 The memorial was constructed on behalf of the City of Cape Town municipality to house the remains, and provide an exhibition space to explain the affair. The opening of an artisan coffee shop named Truth in the memorial building in 2010 however created further contestations on the grounds of taste and respect for the dead. The memorial features a number of fixed interpretation boards which explain the colonial burial system, the unmarked cemeteries beneath the modern city, and the type of people likely to have been buried in them. Enslaved people, of course, feature in this number. The bones themselves are situated in an ossuary area, accessible by a low entrance. They are separated from the public by a wooden gate. Whilst research applications to study the bones are invited, no applications have been accepted at the time of writing by a panel including stakeholders from various sides of the exhumation debate. Entry written by Sam North. Museums are exciting places to see the usable past in action. They bring together objects, people and places to provide interpretation and facilitate discussions on a range of topics, from history to human rights. There is a global tradition of museums representing slavery beginning in the early twentieth century. These museums range from small, local community museums in the UK, that focus on individual abolitionist leaders, to redeveloped slave forts on the West African coast and large national institutions in North America. As well as providing visitors with information about slavery, both historic and modern, museums can also provide evidence as to how societies are thinking about these issues. This collection showcases museums across the world that house permanent exhibitions relating to slavery and abolition. There aren't any related items yet. Why not view everything in Legacies on Display: Slavery in Museums?